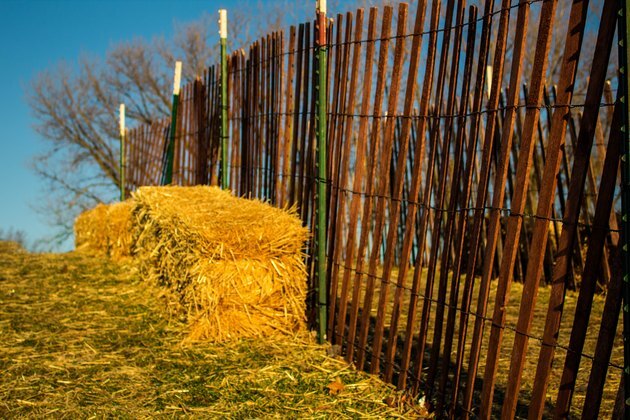 A wooden fence can increase home safety while keeping out invasive critters. That said, you're going to want to make sure your fence is sturdy and resistant enough to withstand the test of time. To help your fence last longer, you can add a wood top cap to each post, which is both decorative and practical. Top caps can protect your fence's end grains to expand its longevity and sturdiness. Before installing your fence, be sure to research fencing guidelines in your location, as a building permit may be required. Once you have the green light, get the proper tools and begin construction. First, select your fence type in order to determine which panels to buy. Once you've made your selection, determine your property line. Where do you want the fence positioned in relation to it? Use spray paint to outline your proposed fence line and measure the outline of your fence perimeter using a measuring wheel. Choose where you want to place your gates and spray paint lines to indicate gate placement. Measure and document gate sizes. Position the fence posts 6 to 8 feet apart along the line you want the fence to be located and use chalk lines as a guide. Make sure spaces between posts are consistent. Dig holes three times wider than the post and half as deep using a post hole digger. Make sure you don't interfere with utility hotlines or pipes. Once holes are dug, pour 4 to 6 inches of gravel down the base and add 6 to 8 inches of concrete mix once the gravel has set. Place the posts in the concrete mix, and plumb the rails with a level. Make sure to allow proper drying and curing time, which may take up to three days. Once the concrete has dried, attach the fence rails to the posts. Fasten each rail with #8 2 ½-inch deck screws or galvanized 10d 3-inch nails. Once the rails are in place, attach the pickets, securing each with #8 2 ½-inch deck screws or galvanized 10d 3-inch nails. Finally, complete your fence with post caps. Tap each lightly with a rubber mallet until they fit snuggly onto the post. Wood post caps come in a variety of types, including flat top, pyramid and round. They're meant to protect the wood posts from adverse weather conditions and insects. As with other wood products, it's important that you cover your wood post cap with a high-quality exterior finish. This will help ensure the wood's beauty and longevity. Make sure to apply the finish before installation.